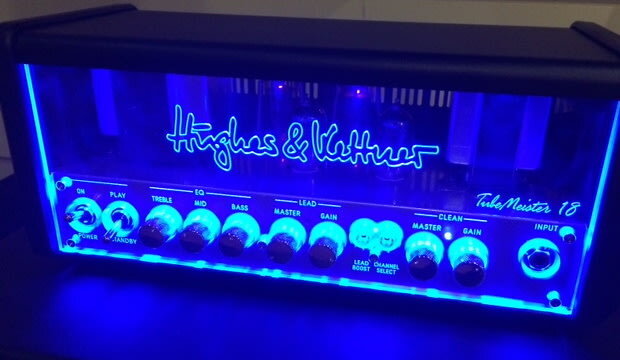 Before I get into the actual report, before getting the TubeMeister 18, I never thought I would review a Hughes & Kettner amplifier, let alone own one. To me, they always seemed to be more Prog and NuMetal machines. But once I got mine — and I have to admit I bought it off my friend based upon the DI feature, and about ten minutes of test time — I haven’t been able to stop playing it. Then looking at the H&K artists page on their site, the fact that one of my all-time favorite guitarists, Davey Johnstone, plays a Hughes & Kettner completely reinforced my decision to hold onto my new amp; admittedly, in the back of my mind I was thinking that if I didn’t like it, I could always flip it. Based upon the silent recordings I’ve done with the amp thus far, I knew I was going to hold on to it at least for a little while while I write new material that has suddenly made its way into my creative consciousness. But after playing with the amp at a gig yesterday, I’m going to be holding onto this amp for a long time. Yesterday’s gig was just a simple trio as the “opener” for a memorial ceremony. A former bandmate asked the other members if we’d play the gig. A couple of us could do it, so we got together before the ceremony, picked a list of songs, then the gig was basically a jam session as we were to only play instrumentally. For the gig, I brought my Slash L “Katie May” which was plugged directly into the TubeMeister, which went out to a 1 X 12 with a Jensen Jet Falcon speaker. Clean or dirty, the TubeMeister just sang. But what was impressive with the lead channel, was the smooth distortion that the amp produces. I’ve been so used to Marshall-style break-up that tends to be open, in-your-face, and super mid-rangy. But the voicing of this amp is such that the tones are a bit deeper, so that distortion is super smooth. Then add the amazing sag and sustain of the amp (and apparently what H&K amps are known for) on top of that, and that’s simply a recipe for inspiration. It didn’t hurt that I was playing with close close friends with whom I’d played music for over twenty years. We’ve learned to play off each other and it’s very natural, and we all take on our roles automatically. When you have that level of comfort with playing partners, it just frees your mind to be creative. Probably the most amusing song we did was an instrumental version of “Crazy.” I started playing the lead clean, but after the first go-’round, I switched to the lead channel. I had set up the amp so there’d be very little volume change between the clean and lead channels, and set up my guitar so I could vary the amount of distortion using my volume knob. Then getting out of the blues mode, I went into major-scale, legato runs, and turned the song into a bit of a metal, prog version that made all of us laugh while we were playing. After the song, we laughed out loud, and I said that I couldn’t believe how expressive the amp it. My mates also remarked how incredible that amp sounded, and I told them, “I daresay that this amp sounds so good, it rivals my beloved Aracom amps.” Mind you, it’s a completely different sound than the vintage-Marshall, snarling dog sound that I love. But this smooth sound is absolutely incredible to me as well. Needless to say, it’s a keeper! When I got my Hughes & Kettner TubeMeister 18, I immediately thought to myself, “I need another amp like I need a hole in the freakin’ head.” But in the back of my head, I was thinking this was going to be a good purchase. I was counting on the RedBox DI solving a lot of my recording issues; especially with respect to ambient noise. In my home studio, which is my garage, I share the room with my water heater, and not having much sound padding other than a carpet, my mics pick up a lot of ambient noise. It’s especially challenging to record clean guitar. So I was hoping that the TubeMeister’s DI would solve a major sound problem for me. Well, it has. The amp is billed as being able to do silent recording, and after playing around with it for the last week, I can confidently say that it lives up to the billing – in a big way. The guitar I’m playing is Katie May, my Slash L Guitars custom by Perry Riggs. For the rhythm track, I’m playing in single coil mode in the neck position, and the lead is played in humbucker mode in the bridge position. For the clean, I’m playing with the clean channel with the Master cranked and Gain about 9am so the signal is absolutely clean. For the lead, I’m playing the lead channel, with the Master at 10 am, and the Gain at 3pm. Kind of weird settings from what I’m normally used to. What I found with this amp is that it breaks up pretty early. It’s not a bad thing, but I’ve had to kind of rethink my amp settings. But in spite of that, once I figured out how to set up the amp, I can’t believe the gorgeous tones it produces. And imagine that these tracks were recorded with the DI!!! OMG! It’s amazing!